How can I help make a Trash Robot? The answer to this question is I truly do not know, however I no somebody who does, and that somebody is you. how would you like to be part of the conception of this device. After-all we need a Trash Robot right? There’s a niche for this and it is going to happen and it will be possibly the biggest idea of 2009, but by that time we will probably be somewhere near 2012. So in a bid to step up the procedures I have made this post to firstly explain just what the trash Robot might be, then secondly I will explore just what types of people the trash robot may help then finally I will explore a few more possibilities after all Robot’s and rubbish are made by man. We are the trash men and trash women that create the heaps of rubbish which no-one else would think of going through. And like hoarders of rubbish there will always be resistance. So lets first start with the preliminaries, we live in an age of confusion and a world which is amounting some great new devices but at the same time and this is not me being nostalgic we are neglecting some of the older technologies as we move forward, think for a minute if you will about how you felt about the cassette player when we moved into an age of I-pod not forgetting the CD which we still have on new computers today. Some us I ‘m sure were a little reluctant to move forward and try this new device, and the progression of these devices, in hindsight were indeed part of a logical progression in the chain of listening to music and audio recordings. But my question is how do you suppose they connected the dots to come up with the ideas to bring these new technologies into mainstream. trash cart which you would pull along very long high streets with a small brush and you would have to constantly be going up and down the street. If you are a housewife and it is your job to clean the house and are constantly taking out the trash and don’t know how to improve your recycling skills then imagine having a Trash Robot to help you whilst your husbands away at work. Just a few ideas that I am putting out there to probe the internet group mind. However this will take participation and may involve future questionnaires. For example what concerns do you have about the waste and it’s journey to whatever is salvageable. 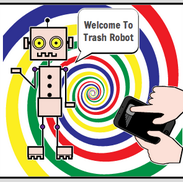 When Trash Robot comes into the mainstream you will be able to trust it like your phone or you I-pod but if the good work it does does not go into the right place all this good work will go to waste. So how can we solve this problem? Many people are very dismissive of problems however this is how new technology are produced, if you have any past successful experience in this, I invite to leave your comments here. So what types of rubbish would a Trash Robot be adept at dealing with? Well so far what has already been thought of is the pick and pass mechanism. Based in a factory setting where the robot is at a conveyor belt and it sorts through all this rubbish but this is a slow procedure and is best done by a human, and some might say is a waste of electricity but it’s the same people who are scrimping and saving and looking for solutions to skilfully do there best at saving money but are like the people who had resistance with change of the phone and always explain why they are using it, almost guilty about the technological advance. By investing in a Trash Robot you may save knowing that your rubbish is going to someone who needs it. Imagine a Robot around the house who knew what rubber bushes are. A robot that did the washing, a robot that could guarantee doing washing without creating any stains in your clothes. Or a robot who knew how to make a great cup of tea but more importantly know where specifically to put the used tea bags in-order for the tea bag to make the grade down the rubbish yard from the right bag, to the right collection machine. These are very simple yet interesting ideas and again if you had an appliance such as the Trash Robot in the home you would think twice before hoarding rubbish. Don’t leave it till 2012 to get this thing moving, the dust is rising! It can be a problem, WordPress has a big community of really dedicated bloggers. You can find similar bloggers or search for other WordPress users that you wish to connect with by logging in with a wordpressdotcom account then connecting this to JetPack. By following, liking, starring posts and engaging you may get some attention, that may hopefully help you get more readers. Forming constructive habits like this outside of all your nice posting will help raise your sites visability. Be mindful though when posting links on other people’s sites because it may have a negative impact, worse still I suspect degrade page rank. I know we use no follow links and I maybe mistaken, though just in case you link has been deleted. Sorry I cannot read mandarine can you share name or preferably @trashrobot Twitter handle please so we can talk more there. Yours in robotics, Trash Robot.